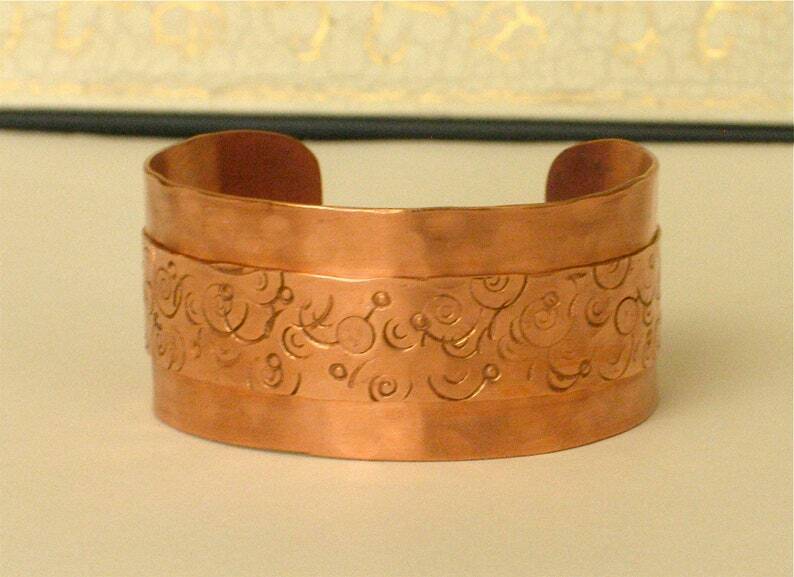 A pretty and solid copper cuff made for a small wrist. I started with one inch wide 20 gauge copper, rounded and filed the ends, and then hammered it to give it texture and strength. Then I took a strip of 24 gauge copper 1/2 inch wide, cut it a little shorter then the 20 gauge copper. I stamped it all over with swirls and dots, and hammered it a little. Then I riveted that to the piece of 20 gauge. Shaped it into a cuff bracelet. There is just a little bit of flexibility to this cuff for adjustments. This copper is not oxidized or treated with any wax. To keep it penny shiny, store it in a zip lock bag. Or leave it out for awhile so it turns a nice chocolate golden color, and just polish it up a bit with a polishing cloth.